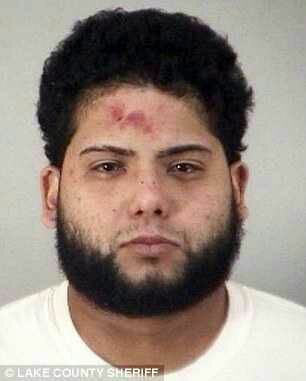 Carlos Adonis Ramos-Erazo, 24, was arrested for speeding on Thursday andlater peed and pooed in the police car - BlogIT with OLIVIA!!! A man pulled over for speeding told police he was racing home to go to the bathroom - he later urinated and defecated in the back of the patrol car on the way to the jail, according to authorities. Lake County Sheriff's officials say 24-year-old Carlos Adonis Ramos-Erazo of central Florida refused to get out of his vehicle after being nabbed for going 20 miles over the speed limit on Thursday.Ramos-Erazo was driving 75 mph in a 55-mphzone on Thursday morning on U.S. Highway 27, according to the affidavit.He said he had to go to the bathroom and abruptly drove off, hitting the deputy's arm with the vehicle. Authorities say the deputy followed the man to his home. When the Ramos-Erazo tried to run inside, he was shot with a Taser.Authorities say he then had an accident in theback of the police car.The Daily Commercialreports he faces charges including fleeing and battery on a law enforcement officer. He was released after posting $18,000 bail.